WASHINGTON (July 4) — Bands came here today to march in the National Independence Day Parade from faraway places like California, from closer places like North Carolina and Pennsylvania, and from midway places like Arkansas, Texas, Florida, and Illinois. That bird-like monster is the source of the school’s mascot, which the band brought along. They marched the hot mile and a half down Constitution Avenue from about 7th to 17th Streets and elicited a response from the next band in the marching order. “Get your bird under control,” Kyleigh Hallows, a rising junior, quoted the next band as saying more than once to signal their annoyance with the bird. And before she was overcome with dehydration before the band even got to 10th Street, Mackenzie Behrends, a rising sophomore, said she was also aware that the mascot was getting a little under the skin of the next band. Ms Weinberg accompanied Mackenzie to an ambulance while the band’s drum major, Ms Weinberg’s “second in command,” took over, as she has done so often at rehearsals. Mackenzie said EMTs administered an IV in the ambulance but ended up cooling her down too quickly, causing her to go into shock for a brief period. Everybody was fine by Thursday morning, Ms Weinberg said, but during the two days leading up to the parade, she had to take three students to emergency rooms at local hospitals (one with a strep infection, unrelated to the heat). We publish here rezzed-down versions of photos taken at the event. For high-res versions suitable for print publication, please visit the album we created on Flickr, here. Please note that Voxitatis makes every effort to cover all schools with equal treatment. So if it’s the Piasa Bird that is the source of this school’s mascot, the source of their spirit is the kind of teacher who holds the hands of 14-year-old students as they get emergency medical care, the kind of teacher whom current high school students knew as their elementary music teacher and were happily surprised to see in the role of band director when they got to the high school, which serves students in several tiny river towns in two counties. After an unexpectedly lengthy breakfast at an IHOP with two servers somewhere in the mountains and a few illness-related last-minute drops, Ms Weinberg marched about 30 Piasa Birds down Constitution Avenue to celebrate the nation’s 242nd birthday. As every year, the DC Metro Police motorcycle squad led the parade. During the festivities, everybody was talking about the weather. Students cooled off before the parade in one of the museums near the starting line, but once the call came to line up, they were out in the heat until the end. In anticipation of the trip, the band went on one of several fundraising drives last year to purchase special lightweight polyester uniforms. Ms Weinberg described them as being “summer weight” or “light mill.” But it was still hot, and one rule bands were given from the agencies that run the parade, which seems to have been made for days that weren’t so hot, was that bands couldn’t break formation to get cool or even bring coolers onto the route to keep water cold. As much as weather affects student safety, it also bears heavily on the musical performance. “It can just be hard to breathe,” said Bailey Weible, a rising senior and the trombone section leader, meaning she’s the senior member of a section of two trombones (she used to play French horn) at a school where band members might work a bicycle wheel into the halftime show despite bleachers that aren’t high enough for fans to appreciate the artistry fully. But even for percussionists, who lug around big bass drums, or tubists who port instruments weighing up to about 30 pounds during a parade, the heat can be problematic, Oliver Rayson confirmed, speaking as the percussion section leader. At a school like Southwestern—where the smallness contributes just as much to the size of the trombone or percussion sections as it does to the way students interact with each other in the cafeteria or in life in general—the closeness students, parents, and teachers feel was evident as they reflected briefly on this trip. “I think if you were to visit Southwestern with a visitor’s badge on during first period, everybody in the school would know who you are and what you were doing there by second period,” Mr Randolph said. The band heads back to Illinois Thursday afternoon, after a photo op at the White House and a visit to the National Archives. Thanks to a new “penny tax” levied by the local governments where the school is located, Southwestern High School now has A/C. “Most of it is air-conditioned,” Oliver estimated. As Ms Weinberg noted that local politicians had stepped in to cover what the state has been unable to supply or pay for, students and chaperones all nodded in agreement. Cool at last. The school also has a wall in the band room on which graduating seniors write their names. With about 20 years of names on the wall, the administration recently decided that it should be painted over, but the one-time presence of such a wall is a testament to a community where graduates return and send their children to the schools they once attended, a tribute to the memories friends make at an IHOP in the mountains or in the back of an ambulance, and a triumph of the educational machinery public schools put into motion in our lives. 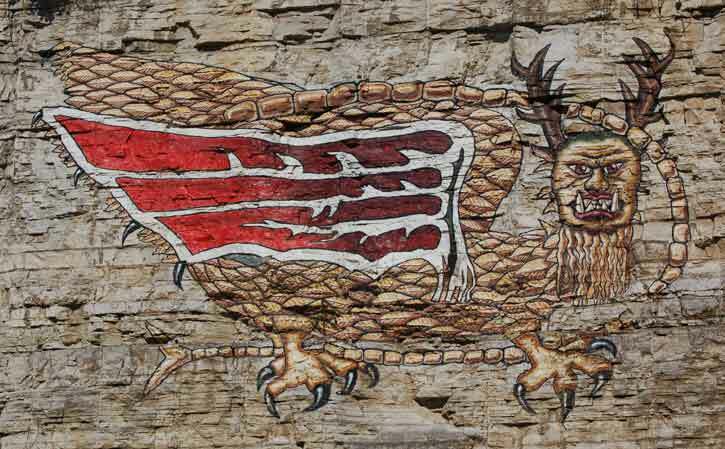 Be the first to comment on "From Piasa to the parade in Washington"